A $6 billion error by congressional budget analysts has created new problems for Senate Democrats in their election-year battle over farm policy with House leaders and the Bush administration. 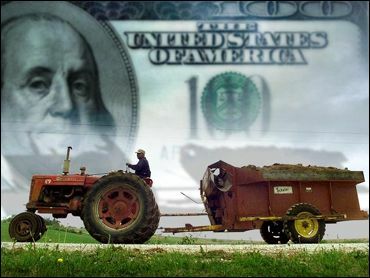 The mistake, disclosed Thursday, means a Senate-passed overhaul of farm programs is $6.1 billion over the spending limit set by a congressional budget agreement. Had the error been discovered before the Senate voted on the bill, its Democratic authors likely would have been forced to sharply scale back the legislation. Otherwise, minority Republicans could have potentially blocked the bill on procedural grounds. "All we can do now is to continue to move forward and address this issue," said Senate Agriculture Committee Chairman Tom Harkin, D-Iowa. House Republicans had openly questioned how the Senate bill could create new subsidy programs and increase others and still comply with the budget, as a House-passed bill does. The error "shows the balance and broad base that the House bill has," said House Agriculture Committee Chairman Larry Combest, R-Texas. He said the mistake strengthens his hand in talks with the Senate on a compromise bill. Under the budget agreement, lawmakers are not supposed to increase government farm spending by more than $73.5 billion over the next 10 years. Prior to the error's discovery, that was the cost estimate for the Senate bill. The Senate bill would spend significantly more than the House on conservation and nutrition programs and also would provide a far bigger boost to farm subsidies this year than the House bill. Mary Kay Thatcher, a lobbyist for the American Farm Bureau Federation, said Senate leaders will have to overhaul the proposals in their legislation before they can negotiate further. "It gives a little more leverage to the House side," she said. The House-Senate conference committee that is working on reconciling the legislation already faced a number of thorny issues, including a new $2 billion subsidy program for dairy farmers in the Senate bill and a Senate-passed limit on the payments that individual farms may collect. The Senate bill also would increase subsidies to grain and cotton farmers in a way that the Bush administration says would encourage overproduction of those crops. Farm groups have been pushing lawmakers to finish their work on the bill by the time Congress breaks for its Easter recess on March 22 so that the legislation can take affect for this year's crops. "My biggest fear is that this (error) serves to slow down the process even more than it already has," said Bruce Knight, a lobbyist for the National Corn Growers Association.